The Lake George Power Squadron (LGPS) is associated with the United States Power Squadrons (USPS) and is a Squadron of USPS District 2. The name "Power Squadron" dates back to 1912, when gasoline- powered craft were first beginning to appear. Roger Upton, Rear Commodore of the Boston Yacht Club, formed a Power Squadron within the club. Its purpose was to provide instruction in power boat handling and foster camaraderie among power boat members. The Power Squadron became immediately successful. In 1914, representatives from 70 East coast yacht clubs and boating associations met at the New York Yacht Club and formed Power Squadrons. As the years passed, USPS expanded the geographical reach and scope of its activities. Today, the USPS is America's largest private, nonprofit, non-governmental, non-military boating organization with approximately 70,000 members dedicated to serving men, women, and families who love recreational boating. The USPS consists of 450 squadrons, regionally organized into districts. The Lake George Power Squadron is a member of USPS District 2. The Lake George Power Squadron was first formed in 1947 and has been made up of ordinary people who love boating. The Squadron vision, which began with those first twelve charter members, in 1947 continues today. The Squadron celebrated our 65th year of service to the boating community in 2012. The Squadron's continued goal of safety and boater education continues today. Youngsters and old timers, neophytes and old salts, weekend sailors and circumnavigators, sailors, power boaters, jet skiers, windsurfers, canoers, and kayakers alike make up our membership. You do not need to own a boat to join our Squadron. 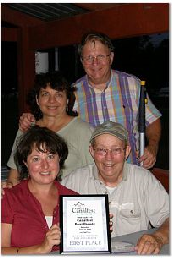 Our members are drawn from the Lake George, Saratoga and Capital District regions of Northeastern New York State. The Lake George Power Squadron is a fellowship organization, promoting camaraderie and educational opportunities among boaters on a local, regional, and national basis. 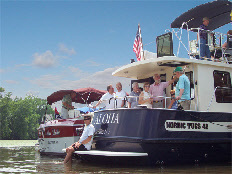 Many social activities conducted both on and off the water take place throughout the year. To see pictures from our past events visit our photo gallery. Contact us to find out more and how to join us!